Four Seasons Resort Nevis: If you’re in the mood for a Caribbean escape, consider a stay at the 196-room Four Seasons Resort Nevis (shown at left), which is fresh from a December 2010 renovation and features a world-class golf course, four restaurants, and a serene spa. Book five nights in a Deluxe Oceanside or Deluxe Oceanview Room or a Plantation Suite, Ocean Suite, or Luxury Suite and you’ll get a $1,000 air credit (applied to your bill at check out). Book a Villa and the credit is $1,500. Rates start at $545/night. Silversea Cruises: The entire month of October is on sale on a selection of seven Mediterranean itineraries onboard two of Silversea Cruises small luxury ships. Prices range from $1,999 per person (for a seven-night Athens to Rome cruise on 540-passenger Silver Spirit , departing October 15, with calls in Malta, Sicily, and Sorrento) to $3,999 per person (for a 12-night Athens to Istanbul cruise on 296-passenger Silver Wind , departing October 19, with calls in Crete, Rhodes, Egypt, and Turkey) – plus you’ll get a $500 to $1,500 onboard spending credit per suite, which is redeemable for spa treatments (that’s Silver Spirit ’s Thermal Suite shown at right), shore excursions, specialty dining, and more. The Ritz-Carlton, Naples: If the idea of a “Spa-cation” appeals, check out the offer at 450-room The Ritz-Carlton, Naples, on Florida’s Gulf Coast. Book as many nights as you wish for $449/night and receive a $200 nightly spa credit to use for treatments or retail merchandise in the 51,000-square-foot spa with its 30 treatment rooms (shown at left). 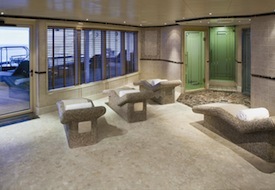 Treatments range from the 50-minute Signature Facial ($145) to the customized 110-minute Intuitive Massage ($285). Located on a white-sand beach, with sunset views, The Ritz-Carlton, Naples features two pools, seven dining options and access to two Greg Norman-designed golf courses. 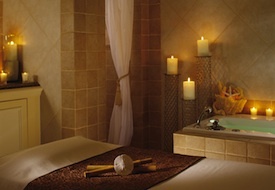 The Spa-cation offer is valid for stays through Oct. 31, 2012. See our Nevis and Naples, FL destination guides for more trip-planning information, then use our Travel Search price comparison tool to find the lowest rate on flights, hotels, packages and more travel deals.